One of our favorite clubs we've repeated over the last few years is 'Battle of the Sexes' club. Below are some ideas if you're using this theme this semester. You can use either of the pictures on the right to Instagram and Tweet about club. When you're posting on social media, make sure to remind kids that guys should wear blue and gals should wear pink. This is a great club to give you an excuse for contact work. Grab some kids ahead of time and make a short promo video you can show at club. Video girls vs guys competing in races, arm-wrestling, etc. Use the Rocky theme music. Divide your club room in half. Put a strip of masking tape down the middle. Make it clear that guys go to one side and gals go to the other. It's a cool visual effect when one side of the room is pink and the other is blue. If you normally do one tunnel for everyone to enter the club room, this week change it up and do 2 tunnels, one for the guys and one for the gals. I edited down a 30 second clip of the song 'Boys and Girls' by Good Charlotte. It's fun and fast and fits the theme. Good to use for short interludes in club and could work for the tunnel entrance song, but you'd likely have to repeat it since it's only 30 seconds. Download the clip here. These are the songs we're singing this week in club. You can download the chords here. All of the slides are already put together and you can download them here. Guys on one side of the room, Gals on the other. 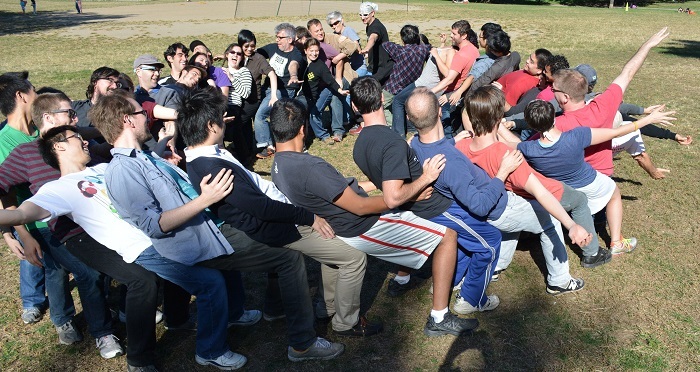 Have your skit characters instruct everyone to race to build as many pyramids of 3 people as possible. If you have 60 kids at club (30 guys/30 gals), you'll have 10 pyramids built. Round 2 is pyramids of 6. 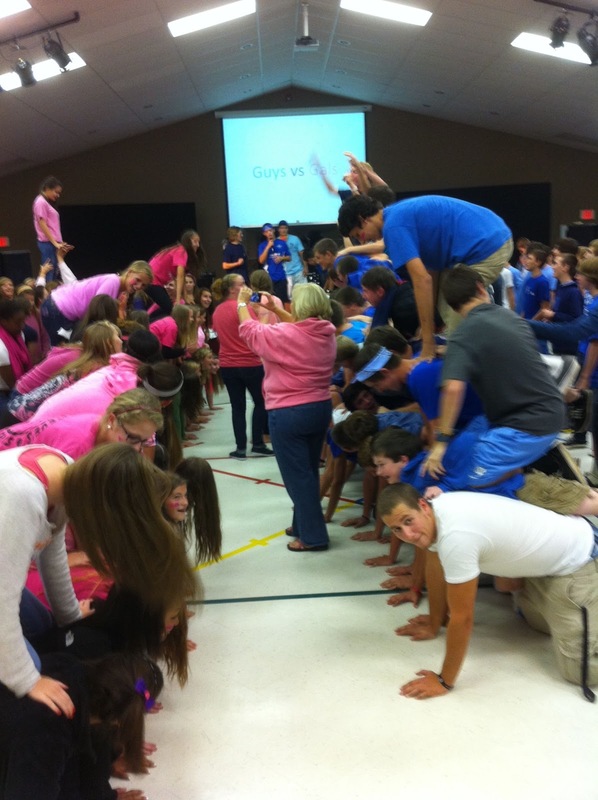 Round 3 is by class (build a pyramid with all freshmen gals, etc...) Round 4 is EVERYONE, guys vs gals (as pictured.) Make sure you have a photographer ready to go- it's a great photo opp. Have 8 guys and 8 girls come up front. Form 2 lines of 8 with 4 guys and 4 gals in each line. Have them stand guy girl. They need to pass down a kiss on the cheek and pass it back. First line to finish wins. Have them do a practice round. During the real contest, secretly hand 2 whipped cream pies to the girls on the ends of the lines. (Prep the girls ahead of time). When the guy turns for the kiss, have the girls pie him in the face. I included in the PowerPoint slides a trivia game you can use. It has a bunch of questions so just go through it ahead and time and delete the ones you don't want to use. It's fun to bring 4 guys and 4 gals up. Make a leader hold a cooking pot on his/her head and kneel down and be the buzzer. Give each line of guys and gals a metal spoon to use to buzz in. Run it like a game show, similar to Family Feud. Have three guys sit on girls’ laps and drink a baby bottle filled with coke and then get burped. Give points for the loudest or longest (or have them burp every 10 seconds). It is funny to put the guys in diapers and a bonnet. The girls can dress like moms, too. Also, you can feed the guys baby food instead of Coke. Call of 3 gals and 3 guys. Blindfold the gals and sit the guys in chairs, facing the audience. Hand the gals makeup and play some good background music and give them 90 seconds to do their best attempt at a makeover. Click here to download slides for all of the songs below and the Battle of the Sexes trivia questions.